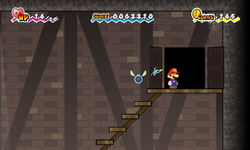 Merlee's Basement is the setting of Chapter 2-4 in Super Paper Mario, and as such is the final area in Chapter 2. What exactly was her plan, and why did she try to enslave Mario and friends? After the incident, Princess Peach notice stairs going down. "Here we go!" she said. The two solemnly made their way down, knowing there was no other path to follow. As Mario and co. go into Merlee's basement, Merlee contacts them via a magical projection. She tells them that she is hidden in the basement and warns them of potential danger. As Mario and Peach advance through the mansion, they meet Mimi disguised as Merlee wanting to bribe them so they have to work of 10,000,000 Rubees again. If Mario and Peach refuse every offer, Mimi will turn into her true form and start chasing them across the mansion. Mario and Peach eventually find Merlee hidden in a toilet, but Mimi appears and shape shifts into her. Mario and Peach then play a "That's My Merlee!" Show to pick out the fake Merlee, but no matter who they choose, Mimi gets furious and attacks them. A battle ensues, where Mario and Peach defeat Mimi and Merlee gladly gives them the Pure Heart. But with the help of Merlee, faithful defender of the Pure Heart, the day was won. But who were the other two heroes mentioned by Merlee? "Countless butlers have been lost in this massive cellar. And masters, too! Merlee was hiding in a faraway toilet. Good thing you saved her and stopped Mimi." This page was last edited on March 19, 2019, at 21:02.